On Monday, May 21th the Georgetown Inn will celebrate 50 years in business as a symbol of the rich history of Georgetown as well as the premiere boutique hotel for celebrities, dignitaries, and politicos visiting the city. During the 1960s and 1970s, the Georgetown Inn housed Hollywood stars, royalty and sports icons such as Astronaut Gordon Cooper, actors Robert Stack and George Burns, the Duke and Duchess of Windsor, and political luminaries like the Kennedy family. 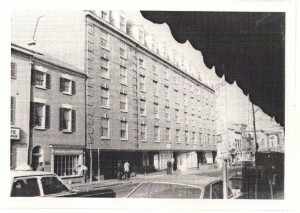 In celebrating a half-century in business, the Inn welcomed new ownership, Your DC Hotels, in November 2011. The new owners and managers pay homage to the Inn’s history and intimate nature as a quaint, 96-room alternative to the large luxury hotels that have flooded Washington, with plans to renovate the hotel over the course of the next few years. Located at 1310 Wisconsin Avenue, between Wisconsin and N Streets, the Georgetown Inn sits among popular eateries, upscale shops, and landmarks that remind visitors of the area’s important role in colonial America. The C&O Canal and surrounding taverns nearby the Inn were frequented by none other than the nation’s first president, George Washington. The Georgetown Inn has a rich half-century history that began with the buzz surrounding its opening in 1962 by American Mortgage Investment Company president Sheldon Magazine. Magazine intended for the Inn to become what it is today – a cultural landmark and a throwback to traditional Georgetown inns that populated the area in the 19th and 20th centuries. In the latter half of the 20th century, the Inn boasted accommodations that had only been available in Europe until its presence – like butlers on each floor and Rolls Royce transportation. The luxury continues with its new face in ownership, with Your DC Hotels committed to maintain the Inn’s status as a neighborhood fixture in Georgetown. To thank customers for its 50 years in business and to look forward to a promising 2012, The Georgetown Inn is offering a complimentary nights stay at the historic hotel as the prize in their “Share Your Memory” sweepstakes. From now until May 31, 2012, customers will have the chance to post their favorite memory or photo of the Georgetown Inn on the hotels Facebook page. One entry will be selected at random to win a prize package including: one night accommodations at the Georgetown Inn, free parking and a bottle of champagne.